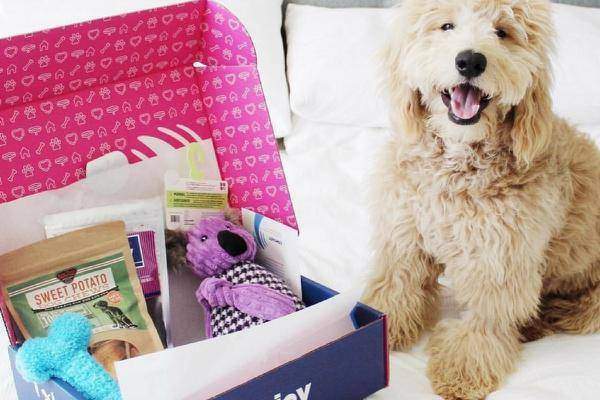 Best Dog Subscription Box for Monthly Toys, Treats, and Fun! As most dedicated dog owners know, life can get in the way of spending as much time as we like with our precious pooches... so one creative way to make sure your dog stays entertained and well-rewarded is to sign up for a dog subscription box. With such a variety of subscription products currently on the market, we’ve created a roundup and review of some of the best monthly subscription boxes for dogs, so read on for the lowdown on everything you need to know before signing up. What are Monthly Subscription Boxes? How do They Work? Why Might You Want One? Who are They Good For? While the products found in subscription boxes vary a great deal, the concept behind them all is the same: you sign up to receive them from a provider, who’ll then send out a box of goodies to you each month. One great thing about the boxes is your dog will be treated to a variety of products without you having to find the time to spend hours combing through the shelves of your local pet store. Once you’ve decided which company you want to try, you can sit back and relax while knowing experienced staff members are choosing the best items to send your way. 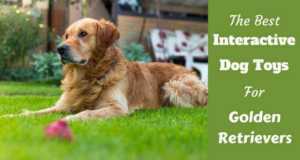 The most obvious answer here is that these products are fantastic for busy dog owners who want the best for their much-loved pet, but don’t have endless time to research new products on the market. Respected subscription companies pack their boxes with high-quality products that are well reviewed, meaning you get some of the best products on the market from the first week you sign up. Another great reason for opting for a subscription box is that it also gives you the opportunity to try out new items you may not have considered at first glance. 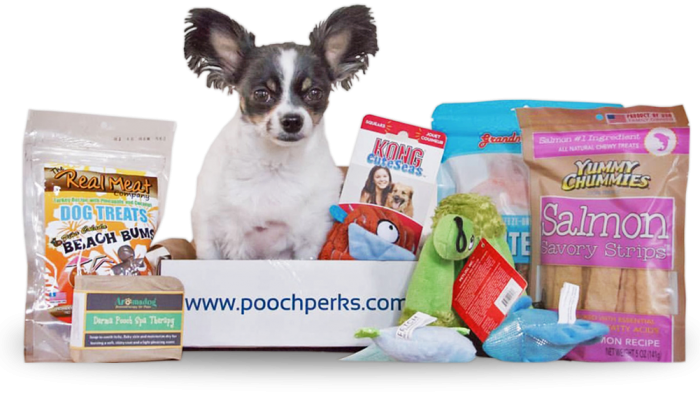 There are a host of subscription box options available, so you could get new food, treats, toys or even accessories to help give your dog a great variety. Lots of companies offer boxes that include food and treats, toys or accessories so you can decide on which type of box would best suit your needs. You may also decide you want to go for a mixture of 2 or all 3 of the products supplied to help you get some real variety for your dog. You need to look at the cost of the plan itself and how much you have in your budget, but you also need to think about the amount you could be saving or over-spending by using a subscription plan rather than going to the pet store. Lots of companies use ‘tier’ based plans meaning they can cater to every budget, so you can specify how much you have to spend, and what items you want to receive. If you’re lucky, you may find a code or deal that means you can get your first order for a fraction of the price of the usual order. With good companies, you can change parts of your order at any point, so you can vary the type of products you want to try without having to pay any kind of ‘admin’ fees. It’s great to look out for this type of flexibility, because if your dog doesn’t like something in your current order, it means you can just head online and alter what will arrive next time. Most companies are also keen to offer a ‘hassle-free’ cancellation policy, so if you’re a first-timer with subscription boxes, it means you won’t get trapped in a deal you don’t want if you change your mind after a couple of orders. This is a company that gets a lot of good reviews, with lots of happy dog owners across the US subscribing to this service. It’s loved most by owners who are looking for a bit of variety for their dog. Barkbox offers an interesting ‘theme’ idea, so you’ll get a great variety of products every month. Although the products themselves will change, the company does guarantee you will get at least 2 toys, 2 bags of natural dog treats and a chew in every delivery. This company is aiming high and likes to cater for a wide range of dogs and owners. They offer different boxes for small, medium and large dogs, meaning that toys and chews will be well suited. The themed variety of products offered means you'll be happy with this company if you like variety and are happy to have different products for you and your dog to try. If you want to stick with 1 particular brand or food type, you may find this is not the best company for you. The idea of themed boxes makes this company’s twist on subscriptions really interesting and unique. You also don’t need to be worried about wasting your money if your dog doesn’t like some of the products sent, as the company is happy to replace any unwanted items with something different if you get in touch with them. There are no tiers to the prices from Barkbox, other than to select the right size for your dog. Boxes for small dogs are $21, for medium dogs it goes to $25, and for large dogs, it’s $29 per box. 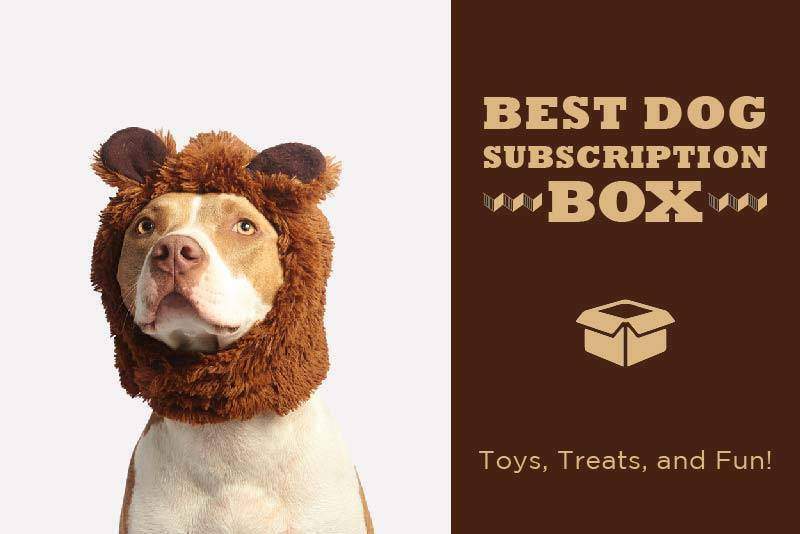 If you want anything other than a box for a large dog, do bear in mind that there’s a subscription length, meaning you might find it harder to cancel if you change your mind about the plan. 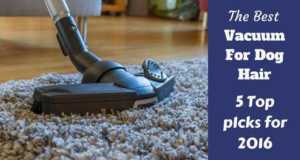 Having products that are all American-made is a real selling point for this company, and many happy customers are happy to review them well. 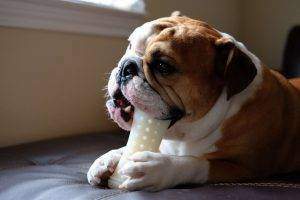 They advertise themselves as selling boxes for dogs, not for puppies, but if you have a dog that loves to try new treats and toys, then this may be a winning company for you. Focusing more on activities, the focus is mainly on toys in the pre-made boxes, with 4 or 5 toys arriving each month. The box also includes treats that are made in the USA. If you decide to head towards the custom boxes, you can pick from ‘treats only’, ‘toys only’, or a mixture of treats, toys, and accessories. 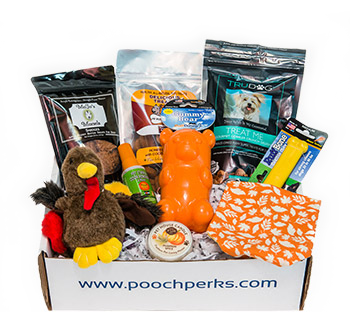 Pooch Perks offers different box options depending on the size of your dog, so any toys and treats will be well suited for the age and breed of your pet. 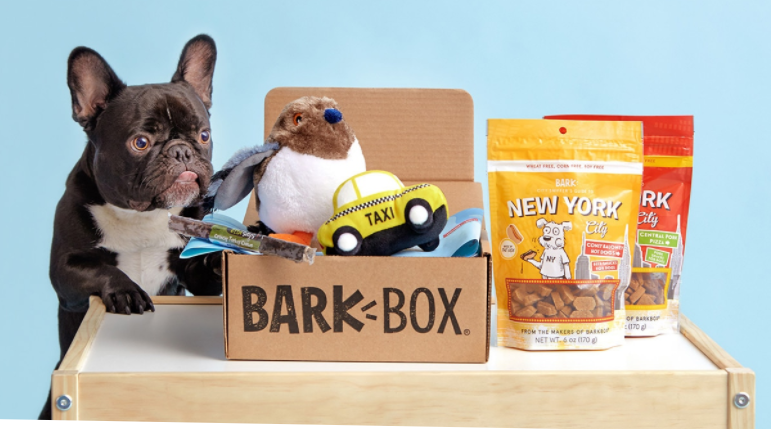 As with Barkbox, this company uses a ‘theme’ each month to help give you fun and variety. To help you get the type of plan you like, this company offers the option of using pre-picked boxes, or ones that you can customize to suit your needs –- this is really great, as it means there’s something for you no matter how much time you have, and how fussy your dog is! Something that gives this company a really caring touch, is they offer grain-free treats, and durable chew toys as options in their custom boxes, so you really can make it perfect for your dog. The pre-made box option starts at $27.95 per month, and the custom-made boxes start at $31.95. However, they do offer sample boxes, and great discounts if you sign up for a number of months when you subscribe… a 12-month plan is the best value one on offer, but there are other deals to be had if you wanted to sign up for a shorter amount of time. Customer service is a big source of pride for this company, so if you do ever have an issue with ordering or delivery, you can expect a quick and professional resolution. Offering a really individual service, if you have a few extra minutes to set up your order, this is one of the best rated companies out there. There are 3 options to choose from depending on your needs: treats only, toys and accessories only, or a mix of toys, treats, and accessories. Once you’ve picked your box type, you then get to customize your items to suit you. PupJoy also offers ‘Grande’ boxes, which can be used in houses with more than one dog, or just suit the needs of large dogs with big appetites. These are the perfect boxes for owners of dogs who have particular needs or preferences -- with treat options like ‘natural’, ‘grain sensitive’, ‘protein sensitive’ and ‘organic’, you really do get to pick the best options for your pet. There are also great options for toys too, so if you have a few minutes to click through the preferences section, you’ll get a fantastic individualized box from this company. 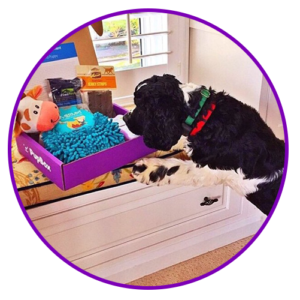 PupJoy is a charitable company, with $2 donated to the Bissel Pet Foundation for every box they sell – so you can treat your pet with great toys and treats, while knowing you’re also helping support a great charity. ‘Pup points’ are also a nice incentive for customers of this company, as you’ll be rewarded for using them and continuing to renew your contract. There are also rewards available for introducing friends to PupJoy, so if you love using it, get talking about it, and you can use those Pup Points to treat your dog even more! Because of the level of customizing offered, it’s harder to get a precise idea of cost until you get to the checkout, but the boxes are advertised as being priced between $23-$44 per box. Offers are available on multi-box plans, so this is a good way to save if you want a few boxes. 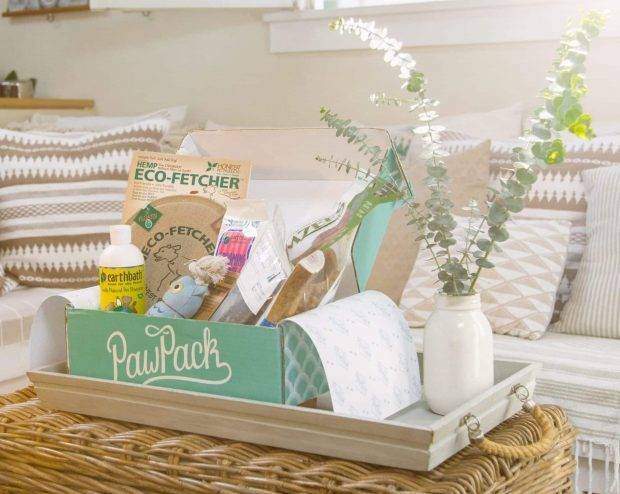 Variety is the top selling point for Pawpack, so if you’re looking to try a range of different products each month, read on to see if this could be the best box for you. In each box, there is a range of treats and chews made from premium quality ingredients, along with at least 1 toy and accessory for you to try out. There are no options for just treats or just toys here, so this box is best suited to dog owners who love to experiment with new treats and toys to keep their dogs entertained. If you fancy treating your dog to a great variety of items, and are a lover of really useful accessories for dog owners, then this company is perfect for you. The variety that comes in each box is a really appealing aspect to the Pawpack brand, and you can be safe in the knowledge that the products included are premium quality to help keep your dog healthy and happy. The one downside of this company is they don’t have a clear list displaying estimated costs, so you need to go through and create a ‘pet profile’ before you can get a sense of whether the product will be in your budget. To give you a rough idea taken from reviews though, prices range from around $28-$43 per month, and that can be reduced if you’re happy to sign up to a 6 or12-month plan. If you do decide this company is for you, then a great bonus is the reward points they offer to help keep loyal customers happy with the value for money they can get. This is another one of the few companies that support animal charities with some of the profit it makes from their subscription boxes, so if you want to treat your own dog, while also giving a little something back to animals in need, then look no further. 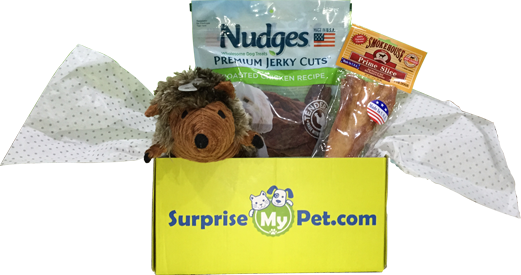 If you decide that Surprise My Pet is the company for you, you can expect a range of healthy treats to arrive each month, along with handpicked toys that will keep your dog entertained and intrigued. There is less of an option to personalize your selection with this company, so it’s best suited to dog owners who are happy to try out new items on a regular basis. If you aren’t interested in the extra accessories that come in some packs, this is a great option for you, and comes in at a very reasonable price for those dog owners who don’t have a huge budget to spend. Unlike most companies, Surprise my pet also has great treat boxes for cats (both individual cats, and multi-cat households), so if you’re an all-around animal lover, the opportunity to treat both your feline and canine friends could be too much to resist from this company! Individual boxes for dogs are $30 per month which is already a fantastic price, but you can still make great savings on that by opting for a 3 month or 12-month plan if you like what you see. If your dog is a very keen or aggressive chewer, you may be disheartened by the destruction of the toys and chews sent by other subscription box companies… but there is hope! Bullymake boxes are filled with hardy items that have more powerful dogs in mind, so you’re more likely to get products that are worth your money and will last more of the month. A selection of 3 or 4 treats are included in the box, but the main attraction here are the 2 or 3 ‘rough and tough’ chew toys that they send. With each toy meant to last at least 2 weeks, if you chose to save 1 of the toys for a while, it should mean you always have at least 1 great product for your dog to use. If you only really want the toys and would rather stick to your current treats, it is worth having a look at Bully make’s ‘toy only’ box options before you head to the checkout. This company makes their boxes specifically for power chewing dog breeds, so it would be no good for sharing if you also have dogs of a less powerful breed. The products sent are designed to last at least 2 weeks, so it can put an end to the days of seeing a brand new toy destroyed within the first few hours. When it comes to powerful chewers, this is a very confident company. Their site gives details of their replacement policy, and explains that if your dog manages to destroy a toy from them in less than 14 days, they will send you something even tougher to keep your dog busy! Individual boxes come in at $39 per month, but depending on what type of plan you might be happy to sign up to, this can drop as low as $31 per month if you opt for a 12-month subscription. PupBox is a much-loved company by new puppy owners, as they offer not only basic products, but also help and advice on how to get through the sometimes difficult stages of training your puppy. A wide range of products are available from this company, including training updates, treats, toys, accessories, and chews. Everything is designed for growing teeth and gums, so you don’t need to worry about your puppy hurting their teeth before they’re ready to use adult dog products. In each box, you’ll get between 5-7 products, and if there’s something you really like from 1 month’s selection, you can easily add that product to your following orders. With training tips and accessories being the main selling point of these boxes, they’re ideal for new puppy owners, particularly those who haven’t raised a puppy before. 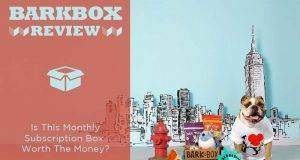 The products sent won’t be much use to an older dog, but you could easily go with the 12-month plan with PupBox before having to consider moving on to a more adult subscription box. By far, the most exciting and unique item in the PupBox boxes are the training guides and tips. All are written by professional dog trainer Andrea Arden (seen on Animal Planet), and offer an experienced insight into tricks and tips that can be hard to pick up if you aren’t used to being around puppies. Individual boxes come in at $39 per month, but can go down to as low as $29 per month if you’re happy to commit long term. Each box is guaranteed to have over $40 worth of products in, so even if you want to try out a 1-month plan, you won’t be at risk of losing any of your hard-earned cash. All of the companies we have reviewed here are very highly rated, and offer great quality products at very reasonable prices. Subscription boxes are a great way forward for any dog owners who find themselves a little short of time, or for anyone who fancies trying new products for their dog on a regular basis. Each company has their own unique take on what to include in their boxes, so spend a while thinking about what products would work best for you and your dog before you pick a company. It’s always worth remembering that longer subscriptions are normally much cheaper, so if you’re confident you’ve made the right choice, then look into subscription options before you checkout to make sure you get the best deal for you. Wendy is a self-employed beauty therapist, mother of two, life-long pet parent and lover of dogs who somehow manages to squeeze in the time to satisfy another of her loves - writing. Wendy is the founder, main contributor to and editor of TotallyGoldens.